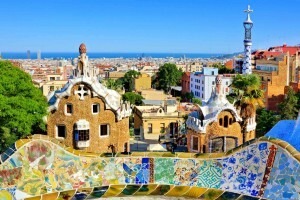 Come see Gaudi’s breathtaking architecture in Barcelona with AESU! Antoni Gaudi, the mind behind Barcelona’s breathtaking architectural landscape, revolutionized the city with his distinctive style, hallmarked by intricate, organic designs. From colorful, sweeping mosaics to sloping stone edifices accented with uniquely tiered roofs, Gaudi’s works are representative of Barcelona’s rich urban history and creative culture. The iconic architecture showcases his striking combinations of ceramics, stained glass, wrought iron forging, and carpentry. Travel to Barcelona and marvel at these unmistakable works of art designed and constructed by Spain’s most famous and well regarded architect. Let’s take a short journey to Barcelona this week and explore the must-see modern marvels of Antoni Gaudi! The most famous of Antoni Gaudi’s works, the Sagrada Familia is an enormous church that has been under construction since 1892. Gaudi built the church to coincide with his philosophical ideas and to visually exemplify the relationship between man, nature and religion. The Roman Catholic wonder has been identified as one of the world’s leading illustrations of advanced human creativity and is a United Nations Educational, Scientific, and Cultural Organization World Heritage Site. The combination of gothic and art nouveau styles stands at a hulking 560 ft tall. Climbing it will give you an incredible, all-reaching view of the entirety of Barcelona. The Casa Vicens was Gaudi’s first major project. Built in the 1800’s, it was a residential design plan constructed for a wealthy family who owned a ceramic factory. Casa Vicens was Gaudi’s first artistic structure to include trencadis, ceramic pieces that beautifully litter a structure’s surface in colorful, irregular unison. Perhaps the family’s occupation sparked some creative energy within Gaudi as the style has been incorporated into his work ever since. See the historical beginnings and novice work of an architectural mastermind when you tour the interior of Casa Vicen’s checkered edifice. A monumental, tower-topped house, the Torre Bellesguard remains a private residence in the epicenter of Sarria-Sant Gervasi District, one of Barcelona’s busiest urban areas. Constructed mainly of stone and brick, the outside stands tall in stately, gothic elegance while the interior houses Gaudi’s notable intricate, hand-painted designs. The interior, the ground floor, main floor, a basement, and an atticare, are unified by the trencadis patterns that mark all surfaces. With colorful sunlight seeping through stain-glassed windows, this architectural wonder exemplifies the juxtaposition of Gaudi’s vastly different styles. Walk through the visual cacophony and be dazzled! Park Guell is a peaceful garden complex which housing Gaudi’s old residence and was built at the turn of the 20th century. The park is covered in the trencadis pattern and is a symbol of Spain’s Art Nouveau movement. Park Guell contains a number of dynamically designed buildings that incorporate intriguing serpentine shapes and it’s colonnaded hall and the terrace are classic examples of the modernist movement. The movement sought modern structures that did not denounce tradition and this is quite evident in all of Gaudi’s work. Come waltz through the striking color contrasts, checkered patterns, and cartoonish angles in peaceful contentedness and plan an unforgettable European vacation this summer! Barcelona is waiting for you! Travel to Spain and see Barcelona in person! AESU offers several trips to Spain, including Euro Explorer and Continental and a 7 day Euro Explorer package to Barcelona and Nice. Explore Spain and its spectacular landscapes and see Barcelona’s celebrated architecture and enchanting streets. If you have any questions or want help booking your Spanish adventure, please contact AESU by calling 800-638-7640, or fill out the contact form found on our website! This entry was posted on Wednesday, June 22nd, 2016	at 9:28 am	. You can follow any responses to this entry through the RSS 2.0	feed. Both comments and pings are currently closed.